It's impossible to pick up a magazine these days and see anything but the virtues of modern design. It's as if the Fairy Goddess of All-Things-Modern waved her wand and declared "To be fashionable (chic) is to be modern" - in architecture, furniture and fashion. If you are starting from scratch that would be an easy assignment. But many of us begin with the palette of existing architecture, like a Tuscan-inspired design, for example. Or in the case of dated commercial properties there could be brass finishes or mauve paint. Whatever you have to work with, there is a desire to revitalize the look to compete with newer properties with clean lines and color schemes. 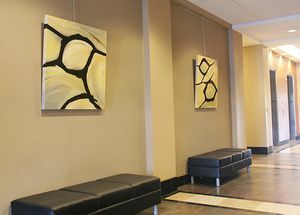 It is amazing what a few modern art pieces can do to breath life into a space. 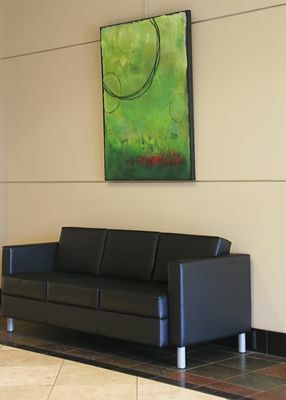 Recently, I worked with a couple of commercial clients in San Antonio to change up their lobbies. 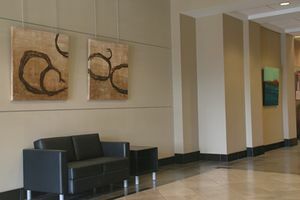 In addition to the new artwork, the company who occupied the building added their own photos. This combined with new contemporary furniture really transformed their space.